Sime Silverman launched his now-famous sheet on Dec. 16 1905 and we launched Sime’s site on the same day in 2002, nearly 10 decades later. 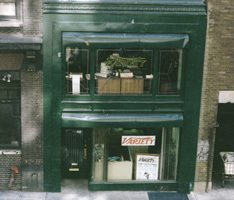 The idea was that Sime’s site become a contact point for people associated with Variety while it headquartered at 154 West 46th Street, N.Y. (See pic below) as well as a place to commemorate the achievements of those who built a unique publication. Have a click around, you’ll find plenty of interesting stuff, both nostalgic and updated. It has been 35 years since the Silvermans sold the “Bible of show biz”. Most of those who worked for the old sheet still feel a twinge of nostalgia for what was not only a newspaper but an institution, whether they worked as staffers in New York, Los Angeles or any of the overseas bureaux, or just contributed a “string”, payment for which was handled on the third floor of the old Variety building just off Times Square or, as it was inevitably tagged, Sime’s Square. Over the years since the sale, ex Variety muggs, whenever they get together, still reminisce about the old sheet. They evoke old friendships and animosities that still rankle. They remember anecdotes and the way it was, when all of us were younger. Some have gone on to other jobs, or retired, or cashed in their chips. A very few are still employed by the present-day Variety, which bears little resemblance to the sheet that Sime founded, just like present-day New York bears little resemblance to what it was in 1905 or 1940 or even 1986. Often I have toyed with the idea of putting out a kind of newsletter for Variety alumni of the old school, on the cheap, of course. The subject of doing such a project came up again when I was having lunch with Roger Watkins and Jack Kindred in London 2002. With his usual enthusiasm, Roger suggested a web page instead of a printed newsletter, and immediately offered to handle the technical part of it (with major help from son Ian, who is a computer wiz). By the time I got back home a few days later, Roger had already taken a site on the Internet, appropriately enough titled Sime’s site. The purpose of the page, as mentioned, is to provide a link for all those who are interested in maintaining some sort of contact with the old crowd who worked on the paper when it was still known as Sime’s sheet. We’ll provide some info, tell some yarns which you may or may not have heard already, dip into a bit of heart-warming nostalgia, let you know who has departed this mortal coil, and perhaps provide a few minutes of amusement. If you have comments, suggestions or copy to contribute, please send it to our e-mail address: peterbesas@yahoo.com. You can also submit graphic material or photos, but be sure to caption it. Also, we would like as complete a listing as possible of e-mail contacts of former muggs, so should you know someone who was part of the old org, let us know his or her name and e-mail address to add to the standing list. Finally, remember that this is a labor of love for all of us. The reward for all of us will be your responding and collaborating to get contributions into the web site. Please send ALL material by internet to pbesas@hotmail.com. During November 2002 Roger asked me to help him on a new project. He had lunched that day with Peter Besas and Jack Kindred and between them they had come up with a plan for a website aimed at ex-Variety staffers from the pre-Cahners era. I had been running a Graphic Design company in partnership with my brother, Andrew, for over 10 years and latterly we had become involved in Web Design. My interest is in building sites where the content is kept separately from the page design, thus making it easier for non-HTML literate users to enter articles etc which would appear on the web using preset formats. It turns out that this was ideal for Sime’s site. Coincidentally, I was laid up and off work with a sprained ankle, so I was able to devote a lot of time at home to the initial set up without the distractions prevalent in the office. The investment in time has been considerable at the outset, but the design of the site means that Peter provides all the copy and I keep the site updated.